There are reasons why grocery stores and bakeries are in business - because people like me aren't so great at baking. Last night I attempted to make vegan Mocha Chip Muffins from a recipe I found on the Post Punk Kitchen website. A few weeks ago I went to a vegan cupcake class at Whole Foods and we prepared recipes by the founder of the Post Punk Kitchen, Isa Chandra Moskowitz. I was blown away by how delicious and non-vegan tasting the cupcakes were that I thought I'd give a seemingly easy muffin recipe a try. The ingredient list was simple. The equipment was basic. The directions? Easy enough for a child to follow. 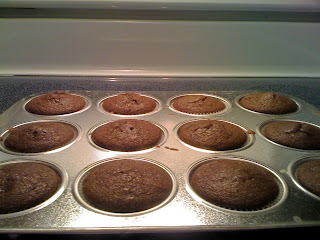 Preheat oven to 375 F. Line 12 muffin tins with paper liners. 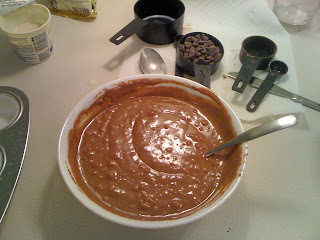 In a large bowl, sift together dry ingredients (flour through salt). In a separate bowl, whisk together wet ingredients (soy milk through yogurt) until emulsified. 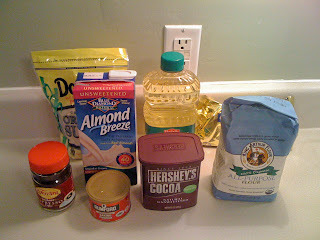 Pour wet into dry and combine until dry ingredients are moistened. Fold in chocolate chips. Fill muffin tins almost to the top. Bake 18 - 20 minutes, until a toothpick inserted into the center comes out clean. Sadly, my finished product looked like a muffin, but smelled like baking powder and tasted a little bit like soy yogurt and chocolate chips. Not really great. (at least not mocha-y like I had hoped) Reviewers of the recipe had said that the coffee flavor wasn't strong enough, so I used espresso powder instead of regular coffee to try to get that extra coffee zing. I may have been better off just eating the chocolate chips out of the bag. For the life of me I can't tell if my palette is off (which I doubt - I just had some awesome vegan goodies from Pattycake Bakery in Columbus - more on that tomorrow) or if I did something wrong while baking these little suckers. I did have to run out for some emergency vanilla extract, so my mixture sat for awhile, but could that cause the flavor to be so off?